It seems quite difficult to keep dogs and cats together however with proper obedience training you can make it possible. The main difference between both is that dogs have been domesticated for thousands of years and that’s why they have developed a close affection for humans. But cats are more independent as people have started taming them quite later. So when you try to bring dog and cat together a power struggle may start between them. One thing to be kept in mind that dogs and cats are different species, so there are huge differences in their nature. 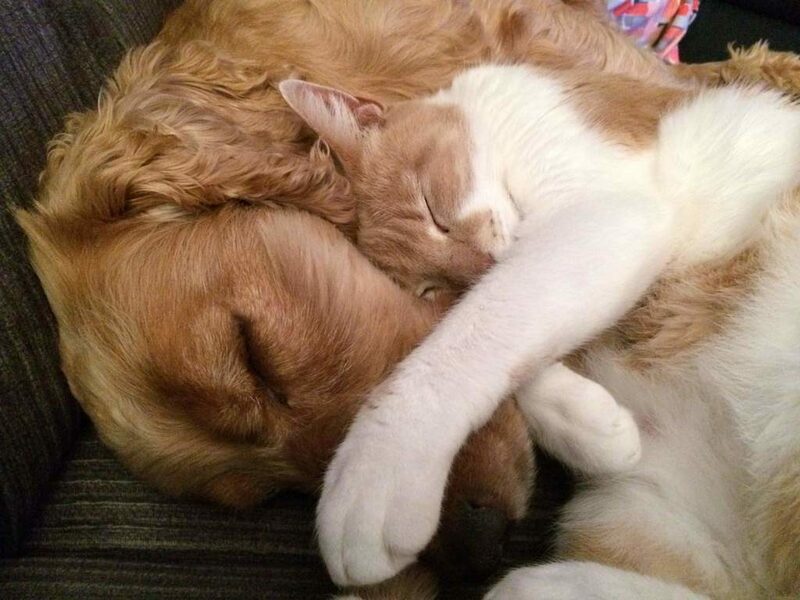 Sometimes dogs may take purring of cats as threatening. Both species may not like each other’s company and become argumentative all the time. So you need to train your dog to leave the cat in peace (or vice versa) while at the same time your cat should be trained to “love” your dog (or vice versa). Here are few tips that can be helpful in bringing your pet dog and cat in harmony. #1. Bring Them Home At Young Age: It becomes easy for them to understand each other, if they are tender in age. So the best approach is to bring home both cat and dog together, when they are young kitten and puppy. You can make them childhood buddies, who will love to play together and enjoy each other’s company. And as they grow in age they will take each other as a part of family. Making it a worthy bonding for life. But you may find it difficult to bring adult dogs and cats together because up to this age cats may have experienced dog attacks and dogs may have started disliking cats. Dogs would love to be predator and cats would like to tease dogs. So you need to be careful and keep patience to make it work for them and for you. #2. Keep Them Away Initially: In the beginning, try to keep both of them separately, but feed and stroke them at the same time. However, feed them in a separate feeding bowls. Also, make sure the cat’s litter box is absolutely out of reach form the dog. It takes time to become conditioned and cope with a new member in the family, but eventually they will get used to it. #3. Introduce Them Gradually: You should gradually introduce them to each other. It will help them to become comfortable in each other’s company. When you bring cat and a dog under the same roof for the first time, you should not be alone. Ask any friend or a family member to be there to help you initially. Both animals could feel uneasy and you along with the other person will act as mediators between the two. Check their reactions during the initial meetings. You can use a barrier in between them for the first few meetings, to avoid any unexpected reactions. If the dog barks or becomes aggressive, try to keep the dog calm and distracted. If the cat has flat ears, moves the tail without stopping and keeps a low position, it’s a sign that you should take them away or divert their attention. Remember to build a great friendship, requires a good understand and the same is true for animals too. #4. Monitor Their Reactions: Both animals have strong sense of smell. But, once they get used to each other’s smell, they are more likely to be comfortable in each other’s presence. Another way to support smell recognition and acceptance is the by swapping the pet’s bedding. If your dog starts to calm down in presence of the cat, then it’s the time to let him sniff the cat. Once your dog starts to decide not to bark at your cat and your cat is not reacting awkward in presence of your dog, you know that you’ve done the introduction part successfully. These are few steps which help both animals to accept each other. And once they get accustomed, it won’t be a great deal to make them friends. After all, it only becomes possible, if you believe in it. You should be confident about the decision and your dog and cat will start feeling it. Your love and calmness will create a positive atmosphere for new guests to feel at home and become the part of family. This entry was posted in Home & Habitat and tagged Cat, Dog.